Salman Khan, who turned 53 on 27 December, rang in his birthday at his farmhouse in Panvel with his family and friends. Many Bollywood personalities attended the bash, including Katrina Kaif, Anil Kapoor, Mouni Roy, Sohail Khan, Sunil Grover, Sajid Nadiadwala, Ramesh Taurani, Sushmita Sen, Jacqueline Fernandes, Bobby Deol, Daisy Shah and Vatsal Sheth. As an annual ritual, his fans also thronged outside his Mumbai residence at Bandra Bandstand in Mumbai to catch a glimpse of the superstar on his birthday. However, the actor has been in Panvel since last night, according to a DNA report. Several images and videos have surfaced online which show Salman cutting his cake in the presence of media. 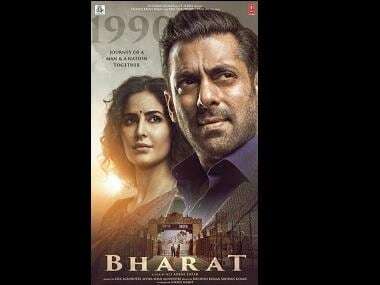 In another video that has gone viral, Salman is seen dancing with his Biwi No1 co-star Sushmita Sen.
On the work front, Salman will begin the third schedule of Ali Abbas Zafar's Bharat in January alongside Katrina Kaif, Sunil Grover, Disha Patani and Tabu.